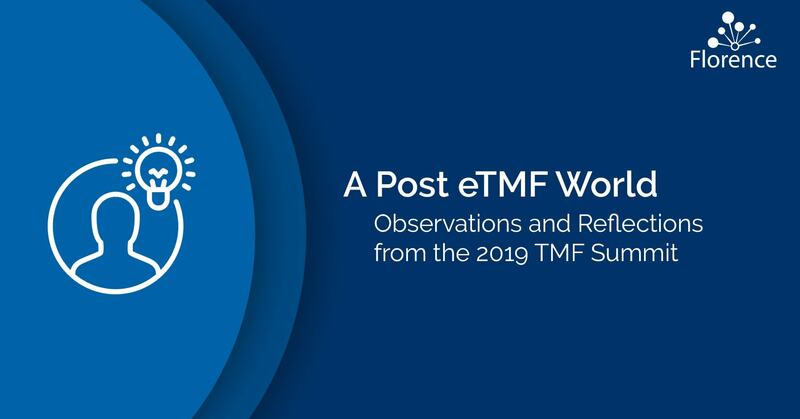 The Florence team just returned from the 2019 TMF Summit in Orlando, and interestingly, the core conversations throughout the conference were not really about TMFs. The innovation frontier in our industry has moved beyond core eTMF features and is now focused on the ring of activities surrounding them. Introduction of Risk-based QC. Sponsors discussed moving away from comprehensive QC and instead created SOPs for monitoring of high-risk documents ONLY and then taking samples for the others. Reduce QC cycle time. Sponsors complained of the cycle time involved with the process of discovering errors on trial site documents, requesting site revisions, and receiving the documents back from the site. One large sponsor admitted that site document cycle time was 100 days from creation to inclusion in their TMF. You can’t have a modern eTMF without a site connector. Vendors like Medidata joined Florence in offering a place for sites to process eTMF-bound documents. Email is the enemy. When pressed further, those that complained of long cycle times admitted that email and physical paper were the primary vehicles for document movement in their studies. We expect the industry to look to the new breed of site connectors, like Florence eHub, to solve this problem. Veeva, the category’s dominant player, left many sponsors wanting support. A crop of firms emerged this year either to compete directly with Veeva, with more personalized service, or to complement the vendor with Veeva-compitable services. When you look at these trends it is easy to conclude most sponsors have an eTMF team, vendor and strategy. Now the leading teams are figuring out how to turn on 1) risk-based QC approaches, 2) site connectivity and 3) services to help them realize quality and speed objectives that are unachievable in an eTMF vacuum. Schedule a demo so we can show you how clinical trial sponsors are connecting to the network of 4,000+ research sites active in our digital site workspace. We would love to welcome you to the Florence Network of clinical trial sponsors maximizing their efficiency by tapping into the Florence network of 4,000+ clinical trial sites digitally connected on the #1 trial site workspace for eRegulatory and eSource.